BOLT-ASSEMBLER-TEMPLATE-2.asm Use this file as template, includes a delay subroutine. KEYBOLT.inc Auxiliary file to be used with template. 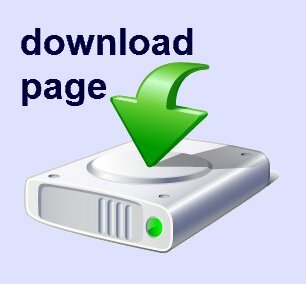 Store this file in same folder as your application program. Includes macros for inicialization and ports definitions. KEYBOLT2.inc Version 2 of auxiliary file. Includes macro to read microswitches. 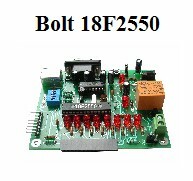 BOLT-FLASH-LED.asm Flashes led B0 in periods of 1 second. BOLT-READS-MICROSWITCHES-V-4.asm Reads microswitches and writes value in leds. 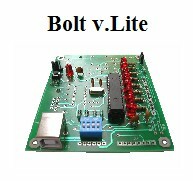 BOLT-18F2550-TEST-PROGRAM-FOR-USB-PORT.zip Leds control program for the USB port, using a Windows VB application. BOLT-ASSEMBLER-TEST-PROGRAMS-FILE.zip Download all .asm and .hex files!